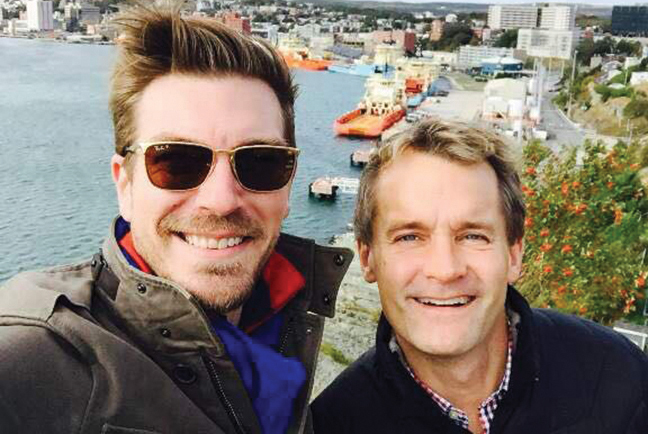 This province’s only federal cabinet minister gets personal on all things mushy, proving all you really do need is love – and lots of it! Admittedly Columbus didn’t discover this home of ours. Heck, he wasn’t even the first European to cross the Atlantic Ocean as that honour is bestowed upon Viking Leif Eriksson, who is believed to have landed in Newfoundland almost five centuries before Columbus even set sail. But, bear with this tale and you’ll understand the relevance of the reference. Before we turn all mushy, let’s talk business for a moment. 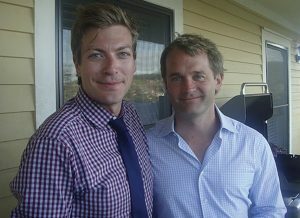 As most know, the Honourable Seamus O’Regan is MP for the riding of St. John’s South-Mount Pearl. This dashing gentleman (who didn’t swoon over the former Canada AM host at least once?) 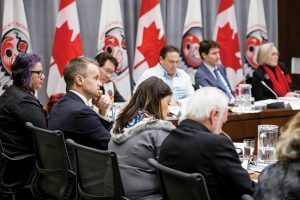 also happens to sit at the federal Cabinet table as Minister of Indigenous Services. And, for anyone who loves braggin’ about one of our own, this isn’t O’Regan’s first prestigious post. Oh no! Our man in Ottawa first served as Minister of Veterans Affairs. But this isn’t a politically-inspired love-in. This one-on-one is all about gettin’ into O’Regan’s personal space. It’s about love, sweet love! Where better to start than at the very beginning. 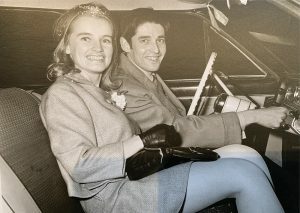 The love story begins with O’Regan’s parents, Janet and Seamus Sr., who were married 50 years ago on Valentine’s Day. How freakin’ romantic, right? Maybe. Maybe not. O’Regan laughs. “They insist it was the only day they could get a church and a priest, so they are very nonchalant about the whole date thing,” he begins. Romantics-at-heart or not, his parents did their best to make their lives together as sweet as it could be. Three kids later, this very busy nurse and judge worked as a team to raise their family. “It was a two career household and they just kind of made it work. Dad made our lunches. Mom sometimes would have already left by the time we got up so Dad took us to school. They just made it work the best they could,” he says reflecting on growing up. His parents passed on life-earned words of wisdom to their children when it was their turn to head off into the sunset. “The best piece of advice they gave to all three of us when we were getting married was; it’s not like you do this and you have to do that and you keep a tally on who did more or less. You just do it. You don’t stop until it all gets done,” he shares. O’Regan took that advice to heart. While O’Regan spends much of his time in Ottawa, his husband Stelios Doussis (Stel) works closer to home, so how do they make their partnership work? Well, the two work very hard to make the moments they do have together count, he says, adding that his relationship is really no different than anyone else who’s living a busy life. O’Regan says last night was a typical example of just making the most of being in the same city. But usually, if O’Regan’s in the nation’s capital, he’s working. Where did the two meet? In Toronto, he shares. “He was working at a restaurant I used to go to and then we met again later and we both went; oh. OK. And that was it,” he says chuckling. 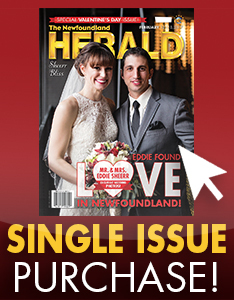 The rest, as the saying goes, is history, and they married in Port Rexton on July 9, 2010. Having the wedding at home was a perfect opportunity to showcase this province. The final hurrah was held on Middle Cove Beach and the sea gave both livyers and come from aways a memorable evening indeed in the form of a rogue wave. Is there a fuss when the two go out in public? With O’Regan’s high profile position and his television past, there must be chatter, we figure. At times, he admits, though often it’s his ‘better half’ who gets the attention. Does he sometimes shake his head at the thought it was finally politics which brought him back to the island and to a life lived near the ocean? Not really, he says, because somehow, at some point, he always knew he’d return to this place. “It’s funny. I always wanted to go home,” he says. He spent years in Ireland and the UK followed by a television offer that would see him move to Toronto. Initially, he called his parents saying he had declined the offer; he wanted home out of it. “I turned the offer down and I told my parents that I wasn’t interested in TV and that I didn’t want to move to Toronto, that I just really wanted to stay home. My parents said, ‘for gawd’s sake, we’ll always be here. Try it for a year and come back if you don’t like it,’” he shares. As the Columbus quote says, O’Regan crossed the ocean alright, but he never lost sight of the shore he knew he one day wanted to return to. “My parents were right and I tried it and I did like it and I’m glad I did that and I’m proud of my time as a reporter and as a journalist,” he says. And when he was ready, home was still right where he had left it. If anything, with his varied life experiences in the rear view, he could more clearly see the future calling and that future was here. He never lost sight of this province’s shore. “When I got older, the calling was even greater, and now to be able to serve and represent this place is a marvelous thing. When you love something, your heart is in it, and that makes it all the more rewarding,” he says. Something else his heart is into? Almost everything home has to offer. 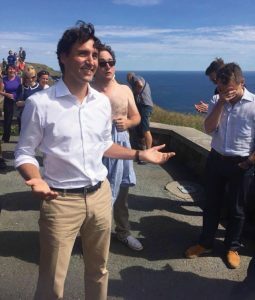 Speaking of Signal Hill, what about the time the Prime Minister was visiting and comedian Mark Critch flashed the works? O’Regan’s expression was probably the best part of the viral image that followed the high-profile deshirting. “I was more mortified for Critch’s children, whom I know. They were there and they didn’t know he was going to do that. My expression was for his boys. I was like, oh my God, no. It was sympathy for them. The sheer whiteness of Critch’s chest is something I’ve born witness to before, so that didn’t shock me, but the poor youngsters? I mean, there was just no need,” he jokes. Speaking of visiting members of parliament… did you hear about the time some political come from aways showed up at the wrong house and stayed long enough to mix a refreshing drink? O’Regan and the PM headed back while the rest climbed aboard the bus – with no address to adhere to, they just sort of winged it. Another fun political yarn was the time the NL MPs held a kitchen party in Ottawa and, along with Allan Hawco and Justin Trudeau, the gang sang – or tried to sing – Rant and Roar. Was he himself singing along? 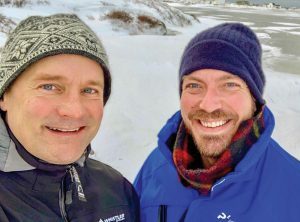 “I was singing the chorus and like the last word of every line, so I’d say I am a typical Newfoundlander,” he admitted with a what-can-ya-do-about-it laugh. Sounds like fun times? Sure, he admits, though the fun times are also sober times for O’Regan these days. Reaching out to the world via Twitter in January 2016, the MP admitted he had entered a wellness program over the previous Christmas holidays in an effort to lead what he called “alcohol-free lifestyle.” He returned to the House of Commons later that month, sharing he had been alcohol-free for 40 days and was ready to return to work. While those were tough times, it was also an opportunity for growth, he shares, and success was possible, in part, because of his husband’s love and support. Is there anyone he looks up to when it comes to happily ever after? we ask. There’s no hesitation. What is it that he admires so much? Again, there’s no hesitation.